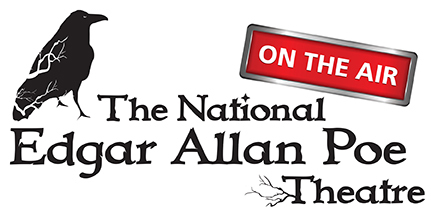 Starting April 17, 2018, and every month thereafter, WYPR-FM Baltimore will air the first in a series of new podcasts by The National Edgar Allan Poe Theatre On the Air, with its production of The Tell-Tale Heart. The series features fresh, 20- to 30-minute podcast adaptations of the best-known works of Edgar Allan Poe. Starting April 17, 2018, and every month thereafter, WYPR-FM Baltimore will air the first in a series of new podcasts by The National Edgar Allan Poe Theatre On the Air, with its production of The Tell-Tale Heart. The series features fresh, 20- to 30-minute podcast adaptations of the best-known works of Edgar Allan Poe, America’s renowned master of horror and suspense. Each episode guides listeners through a mental hospital where each cell houses Poe protagonists, each waiting to thrill audiences with dramatic re-tellings of familiar stories including The Tell-Tale Heart, The Black Cat, Berenice and The Cask of Antillado. Musical underscore and sound effects add even more suspense to the stirring character accounts, brought to life by a creative team of performing artists and talent from the Baltimore metro area. The program will air every month, and is sponsored in part by RavenBeer , Baltimore’s purveyor of Poe-inspired craft beer. Zavistovich and RavenBeer’s CEO, Stephen Demczuk, are launching the podcast series as the first part of their effort to create The National Edgar Allan Poe Theater. Planned as the world’s first performing arts establishment dedicated to adapting for the stage the collected works of Edgar Allan Poe, the theatre will bring tourism, responsible economic and cultural development, and increased English literacy to Poe’s hometown of Baltimore.